This high quality 304 stainless steel bushing is made for high duty cycle shooting and replaces the Ruger factory bushing allowing you to safely remove the Magazine Disconnect from the firearm. This bushing lets the hammer move properly and at the correct speed. 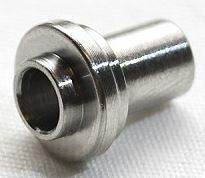 You will be pleased with the fit and final result with this bushing. If you know how to clean this gun you can easily remove the disconnect. Removing the disconnect allows the magazines to fall free, allows them to seat properly and does allow the gun to fire with the magazine out for tactical competition and self-defense scenarios. Check to see if your state requires the magazine disconnect installed if the firearm is ever resold.